for settlers moving from England to Australia in the nineteenth century. safety of everyone on board. The Reverend P. Dunne, who authored a handbook for migrants to Queensland in 1863, commented that “no punishment could be too severe” for those found abusing flames aboard ship (19). time, often through writing about the oddness of Christmas in the heat. anxieties associated with fires south of the equator. temporariness and vulnerability of their new homes was driven home to them. home in the north that could withstand the ravages of the Australian summer. 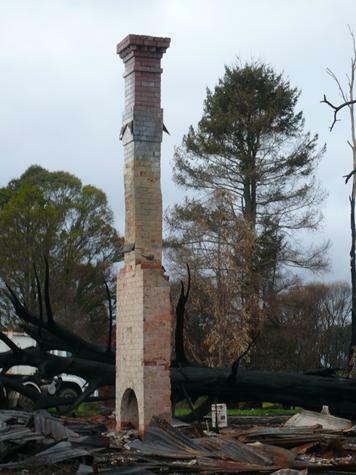 Chimney – ‘The Uplands’, Kinglake, 07 Feb 2009 (Bushfire Damaged). Melbourne Museum (http://museumvictoria.com.au/collections/items/1487715/chimney-the-uplands-kinglake-07-feb-2009-bushfire-damaged).